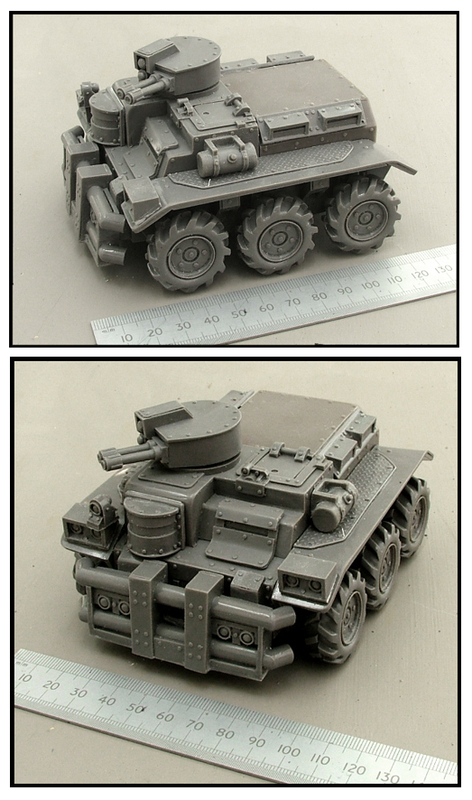 In a very unfavorable comparison to the US Postal Service, the Royal Mail managed to deliver my large Anvil Industries miniature order (581 grams) in just one week for £6. 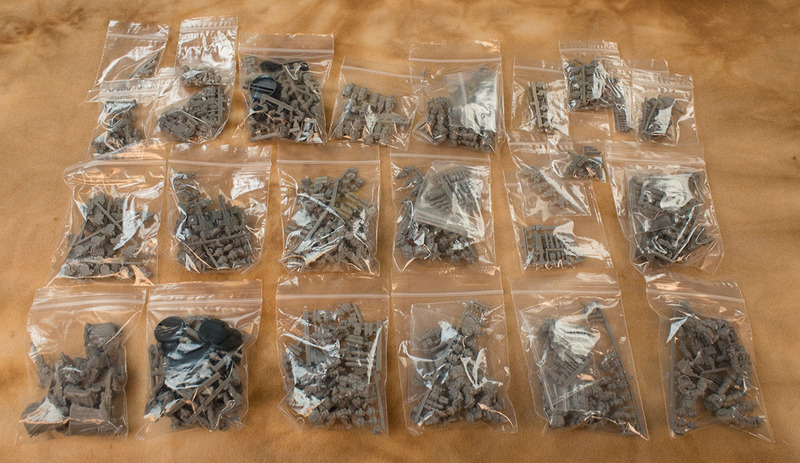 While I've recently paid 5 times that to ship about one ounce of 3D printed minis to Belgium, only to have them lost in transit. But hey, I've got a bunch of new minis that we have permission to use photographs of in our game! So let's take a look at what Anvil, and another company called Ramshackle Games have sent me. That's a lot of stuff (good thing they gave me 20% off)! Let's break it down a bit. 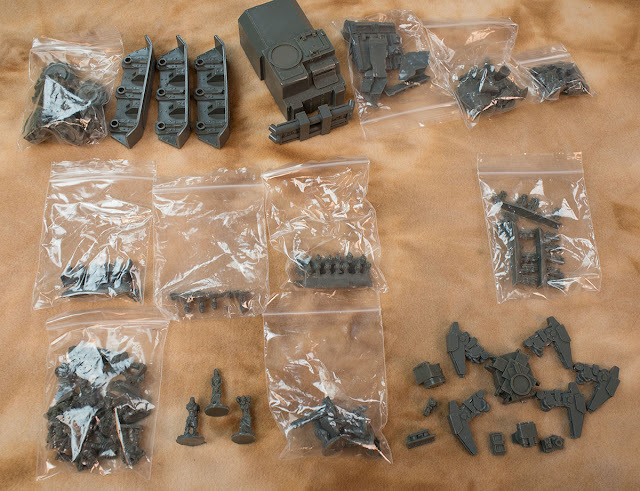 A lot of this stuff is going to have to be put together before I can take meaningful pictures of it (and there are LOTs of different weapon options), so I'll use the official pics from the manufacturer's websites where I need to. Two full squads of these guys, 20 figures total. Lots of cool weapon options, and I dig the special forces look. 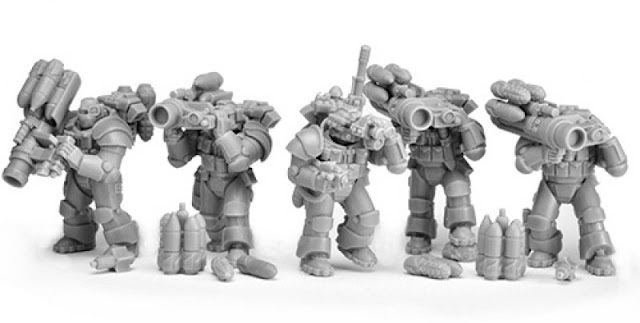 If I had to guess, I'd say that Anvil is sculpting these minis digitally, and then resin-casting them. There's a few casting swirls on the bottom of some of the minis. 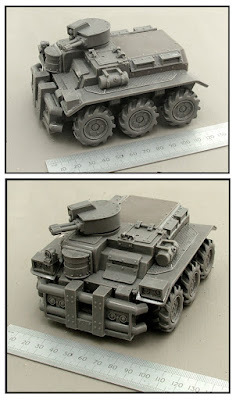 But the minis are nicely detailed, and the material itself is very workable. A bit softer than GW's usual plastics, but not in a bad way. 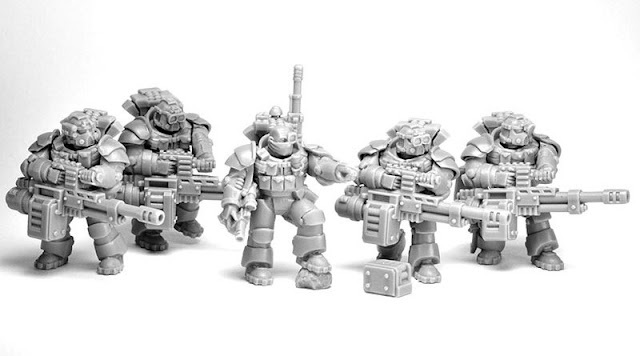 Anvil also carries space marine equivalents under their "Black Ops" line. Unfortunately, they were out of stock on the guys with carbines. But then I noticed these guys. Each one carries a combi-weapon, and the choice of what to put on top of the carbine part is completely modular. Nice! I've always intended for our Knights to be roughly equivalent to a small tank. But it hadn't really occurred to me they needed dual-use weapons as standard. One mode for mowing down light infantry, and the other for taking down other power-armored troops and light vehicles. Perfect! So 20 of these guys, who will have enough different weapon options to cover the range of what we need for book examples and testing. I've also got 5 plain bodies and a crap-load of other weapons (and jet packs) to use with them. 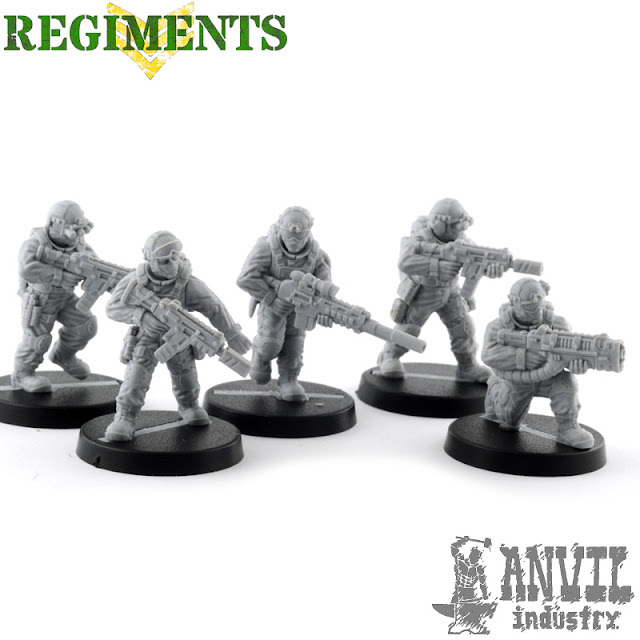 Now THESE are the guys I fell in love with when I saw them used in someone else's skirmish game here locally. And... The missile launcher version. While a bit clunky in appearance, they do look a lot more like real modern ATGMs than old WWII bazookas. I dig it. As you can see, the scales match up very nicely. It is my intention, BTW, to have snipers and other low-mobility heavy weapons teamed up with spotters on a single base. Though probably not with the autocannon minis above. I've got a lot of other special weapons that can be used on some of these figures, but I'll leave that for when we get them assembled. Overall, I'd describe these Anvil models as top-notch GW alternatives. This order came in a while back, and it was kindly given to me for free, but I haven'd had the time to really sit down and look it over properly. Mostly because we're not writing the vehicle rules just yet. Examining the models in detail though, they're not nearly as nice as Anvil's. Traditionally sculpted, they're either overly-blocky (in the case of the vehicles), or overly mushy-looking. What really lets them down though is the resin used in the casting. It's extremely brittle. Requiring very careful cutting and filing in order to not damage the models. The other problem with the casting, is that they're just plain sloppy in places. Take the Wheeled version of Ramshackle's Rhebok transport vehicle, for instance. While not the best looking design in the world, it's a perfectly serviceable transport vehicle. Modded up a bit, it could be really cool. But many of the larger part casts show a lot of shrinkage on the bottoms. The worst offender is the front bumper, which will probably require me to belt-sand down the entire bottom until it's flush all the way across (it if doesn't shatter first). Either that or I fill it with UV curable resin to level it out some before sanding. Either way, it's going to be more work than I'd like. As for why I was given an extra side-fender... Who knows? Also, the less said about the 2.5cm wide flash on the wheels, the better. The bottom of my Rhebok bumper. The drone walker is much better. If you look at the pic of the shipment, they sent along an extra leg, but that one has a different pose that would allow me to model it in mid-step. As for the infantry... The poses are nothing to write home about. And as you can see in this comparison, they're a bit on the small side. 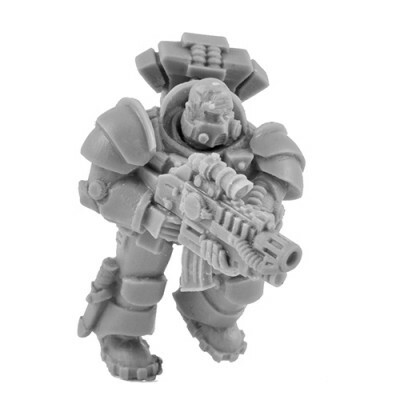 I think this is probably much closer to a true 28mm scale, but they look at least a head too small next to anything from GW. That doesn't mean that I can't use them as OpFor mutants or something though. 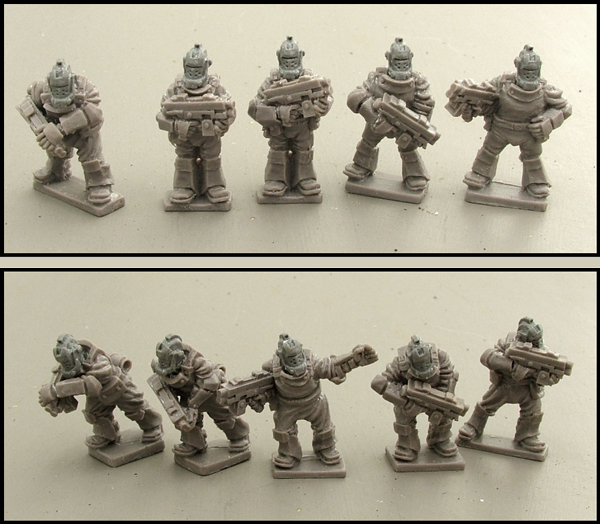 The models I'd really been interested in though, were Ramshackle's prisoner models. Because our game requires them for certain missions. But these minis are pretty small too (their bases are only 17mm in diameter), as well as being a bit too fantasy-like. I can grind the bases down, putty in the holes, etc. But I still feel like I'm going to have to do a lot of work on my end to fix a sloppy casting process. 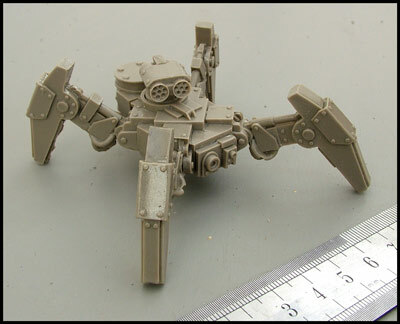 Looking though Ramshackle's website, I'm impressed by the wide range of minis on offer, it's just that I wish they were individually of a higher quality overall. Anvil is the clear leader in this regard. But still, they were given to me for free, and we have permission to use them in the game. That's a plus in itself.